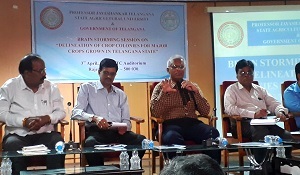 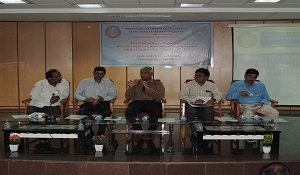 The brainstorming meeting on Crop colonies held under the chairmanship of Dr. V Praveen Rao, Vice Chancellor, PJTSAU on 03-04-2019 at Water Technology Center Auditorium. 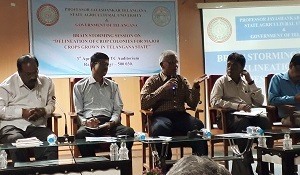 Dr. V Ramamurthy, Principal Scientist (Agronomy)NBSS & LUP, Regional Centre, Bengaluru has gave the presentation on delineation of crop colonies for important crops grown in Telangana state. 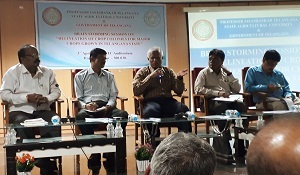 Several officers from department of Agriculture, Scientists of KVK, Principal Scientists of Various crops, Department of Horticulture, Directors of Local ICAR institutes, University officers of PJTSAU were attended the brainstorming meeting.